To me, cooking is an act of discovery–the discovery of combining and pairing ingredients for a remarkably delicious meal. Sometimes, the discovery comes in a disguise and happens by chance, just like this scrumptious dish of Chinese braised pork ribs with daikon and dried oysters (白萝卜蚝干焖排骨). I developed this pork ribs recipe myself, not intentionally, but rather spontaneously. Sometimes, great things do happen with leftover ingredients in my fridge, in this case, daikon/turnip, pork ribs, dried oysters (previously I used them in my chicken congee/porridge), and dried wolfberries/goji berries. This is a traditional Chinese recipe. Using low heat to slowly braise and cook the ingredients–preferably with a claypot–this cooking technique retains the natural flavor of the pork ribs while bringing out the sweetness of daikon and the briny taste of dried oysters. While this Chinese pork ribs recipe is probably not fine-dining or restaurant-worthy, it tastes so pleasing and homey that I strongly urge you to try it out. Chinese Braised Pork Ribs with Daikon and Goji Berries. Heat up a wok or claypot (preferred) and add in the oil. Sauté the shallots until slightly aromatic, then add in the dried oysters and daikon. Do a few quick stirs, follow by the pork ribs, rice wine, soy sauce, and water. Lower the heat to between medium and low, and then cover it up with a lid. Braise for about 20-30 minutes or until the water reduces and thickens. Add salt and sugar to taste and serve hot immediately. If you don't like pork ribs, you can use chicken drumsticks. Just cut the chicken drumsticks into pieces, with bones in. You can use Japanese sake if you don't have Chinese rice wine. I think you did very well with your pictures, the ribs look very tasty. Bee- I like all these things individually but I wouldn’t have thought to put these ingredients together — your dish looks great. Your site always inspire me to try new stuff! I have never tried daikon before but may just give it a try as this dish looks like it will taste great! Well said that cooking is an act of discovery, perhaps art of discovery too! I love and miss “hou see” so much..! someone send me some..!! and fatt choy pleaseeeee..! muahhaha!! Hi, is daikon/radish in hokkien called bang kuang??? Anonymous – thanks for your kind words. Some of the ribs dried out before I finished taking the pictures…LOL! Christine – all together, they are fanstastic. Try it out! Cooking Hut – yeah, I agree. A dear friend of mine said I am an artist…hehehehe. Not too sure about me being an artist, but yes, cooking is certainly an art. Amazing! Mandy – I like this better with steamed rice…the “juice” is soooo good with rice. Drool. Rex – yes, Chinese New Year is coming, it’s time to stock up some hou see and fatt choy. Hehe. Anonymous – it’s called “Chai Tau” in Hokkien. It’s white in color and looks like a bigger carrot, but white. Ooh, that’s interesting! I’ve never tried dried oysters but now I must say I am very, very curious! hahaha ilove that expression!… You should trademark it like BAM! It looks like you said my dear! and I lovvvvvveee dried oysters. delicious with traditional soups! it could have been a soup by itself…daikon and dried oysters make a very aromatic and flavourful soup! your version will go very well with rice, no doubt. lovely! Helen – dried oysters are great for soups and stews, I love them. Daphne – you are right, I just need to throw in some “fat choy” to make it CNY-worthy. Ling – yes, I looove dried oysters too, in soup or stews. Nic – you are right, it was fantastic with rice!! I love it. looks so delicious…I go nut when I have daikon! ok.. added to my must try list.. Looks yummy as usual. what other ingredient do you use for test? yeah, i get what you mean.. it’s not easy to take a good picture out of such mono-color dish. But you’ve successfully made the dish looks appetising, great job! 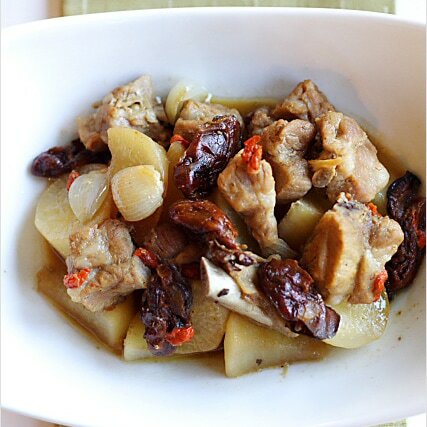 Braised daikon with pork ribs and dried oysters sounds like a rich yummy dish.